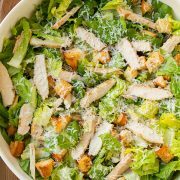 The Best Caesar Salad Recipe with Homemade Caesar Dressing! Once you try this you’ll never want the store-bought dressing and croutons again! 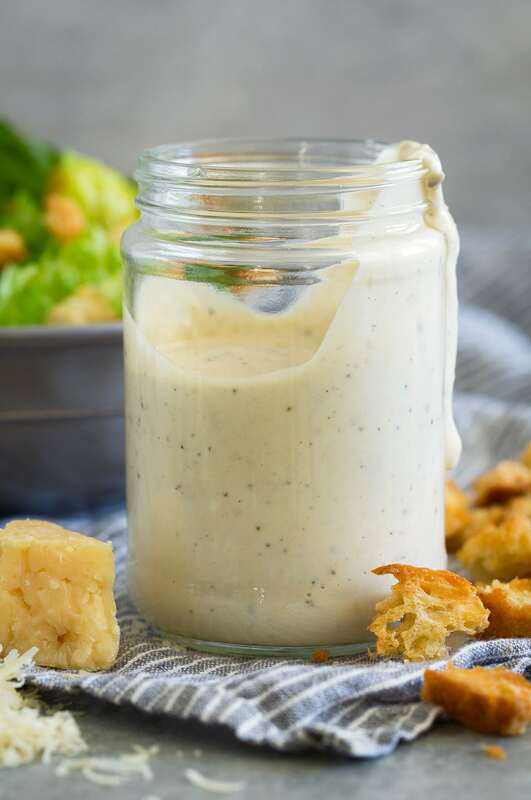 This is the creamiest most flavorful dressing and those perfectly crisp fresh croutons are truly irresistible. The traditional Caesar salad dressing calls for raw egg yolks, but that’s just not really my thing, so I prefer to just use mayonnaise because it still contains egg yolks and the oil needed but the egg yolks are pasteurized. 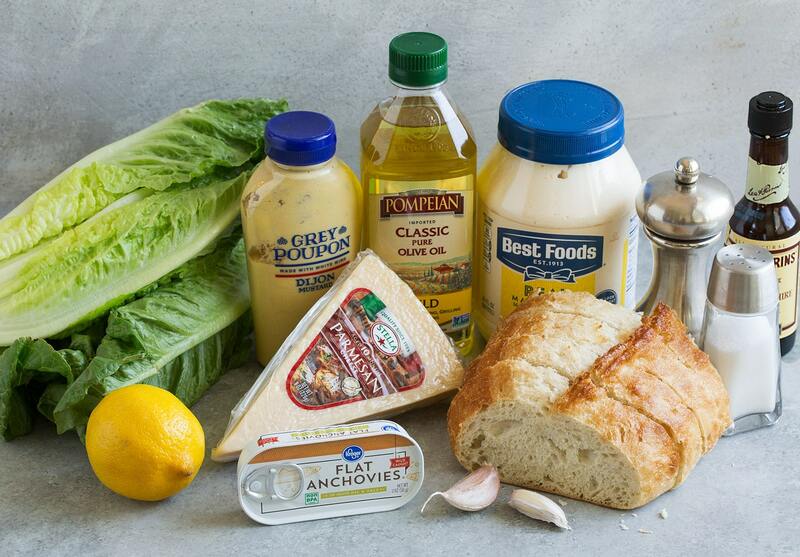 So you still get a rich and creamy Caesar salad dressing without using raw eggs. For the base of the salad, I like to use Romaine hearts because they are crisper than the outer leaves on a head of Romaine lettuce. But if a head of romaine is what you’ve got, feel free to use that. Then of course, those homemade croutons are a must. They really turn a good salad into an incredible salad. Also a must are the anchovies. I used to try to avoid using them, but really they are a game changer. Those tiny little things really pack a flavorful punch, so just pinch your nose and get smashing (and yes the whole anchovies vs. paste really are better, so skip the paste). 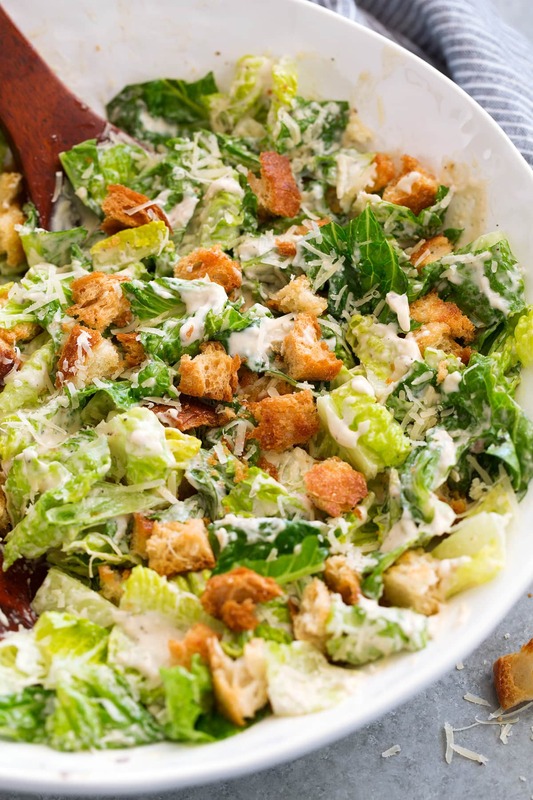 Want to see how easy this Caesar Salad recipe is? Watch the video! First, you’ll preheat the oven to 375 degrees F. Cut bakery bread into slices then tear bread into 3/4-inch pieces and place close together on baking sheet. Drizzle slowly and evenly with olive oil, then toss and spread out on baking sheet. Bake in preheated oven until golden brown and crisp, about 15 – 18 minutes, tossing once halfway through. Let cool. If you’ve never learned how to make caesar salad dressing, don’t fret. It’s so easy! 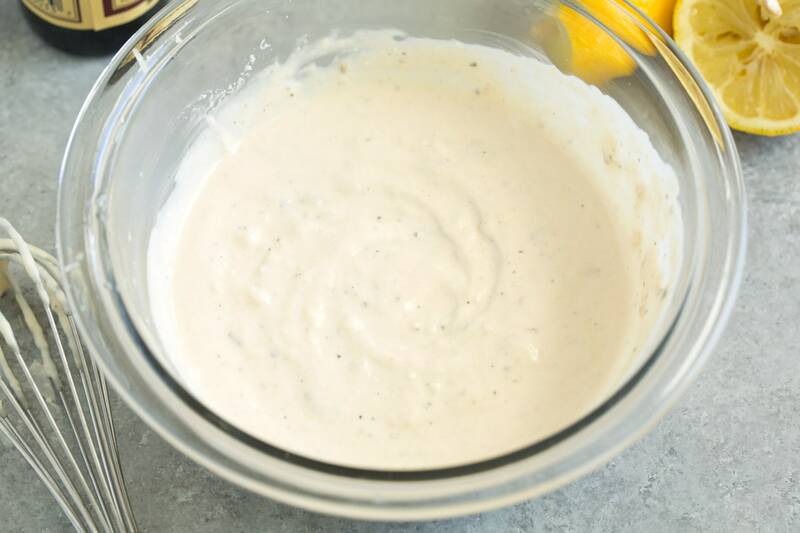 Make the dressing by whisking together mayonnaise, lemon juice, Dijon, Worcestershire, Parmesan, anchovies, garlic, salt and pepper. (Note that some anchovies will mash up better than others. The ones I used here weren’t as soft, but normally I prefer to mash almost to a paste). You can transfer the dressing to an airtight container and refrigerate for up to 1 week if you aren’t using it right away. 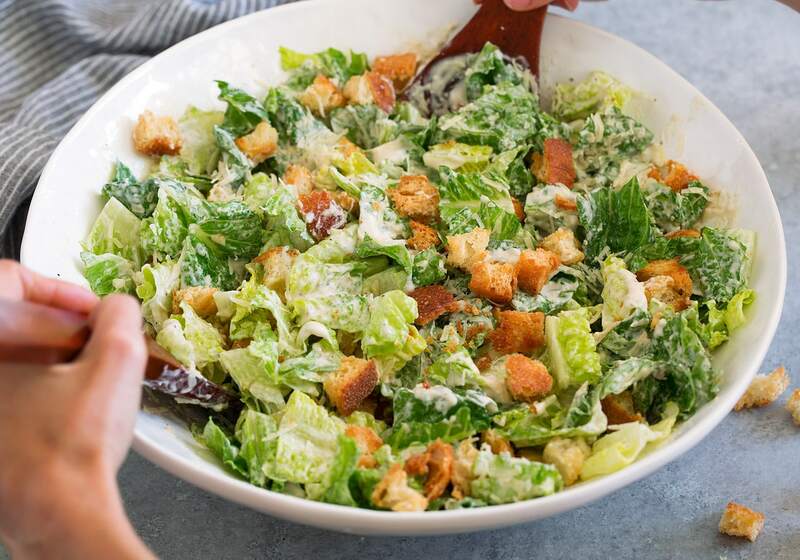 To assemble the salad, place the chopped (rinsed and dried) lettuce into a large bowl, pour dressing evenly over top, then toss to coat with homemade Caesar dressing. Then add in Parmesan and croutons and toss. Serve immediately. Can You Make This a Chicken Caesar Salad? You can definitely add chicken to this salad. You can use grilled chicken, baked chicken, skillet seared chicken or rotissierie chicken. Grilled chicken is best, in my opinion. To make grilled chicken, use 2 (8 oz.) boneless skinless chicken breasts, flatten them out to an even thickness with the flat side of a meat mallet, brush both sides lightly with olive oil, season with salt and pepper and a little garlic powder and onion powder. Grill on preheated medium-high grill for about 4 minutes per side, or until 165 in the center. Let cool about 10 minutes before chopping. For baked chicken breasts, it will be the same method to prep the chicken, but for baking you’ll place the chicken on a rimmed baking sheet and bake in preheated 400 degree oven for about 15 – 20 minutes. For skillet seared chicken, you’ll use the same prep method but skip brushing with oil, then cook chicken in 1 Tbsp olive oil over medium-high heat until cooked through, about 5 – 6 minutes per side. Can I Lighten up the Dressing? 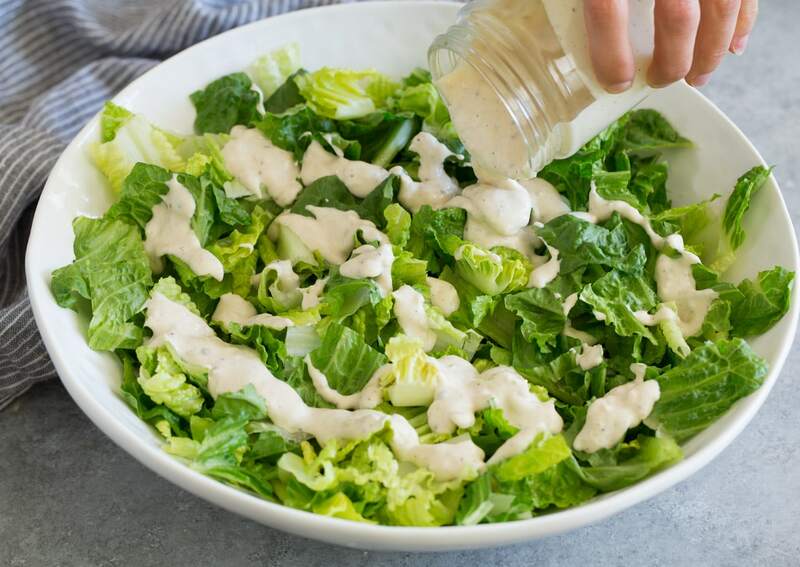 If you are looking to make a less indulgent Caesar salad dressing with fewer calories, try using this homemade Caesar dressing recipe instead. 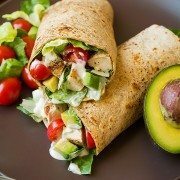 This recipe listed below with the mayonnaise is actually my favorite, but for days when you don’t want to splurge as much you can make the other version. What About Using a Full Head of Romain Lettuce? I like to use the two Romaine hearts, but 1 head of lettuce works too. But keep in mind that every head of lettuce and the Romaine hearts vary in size, so use your best judgement to estimate that you’ll have the best lettuce to dressing ratio you like. 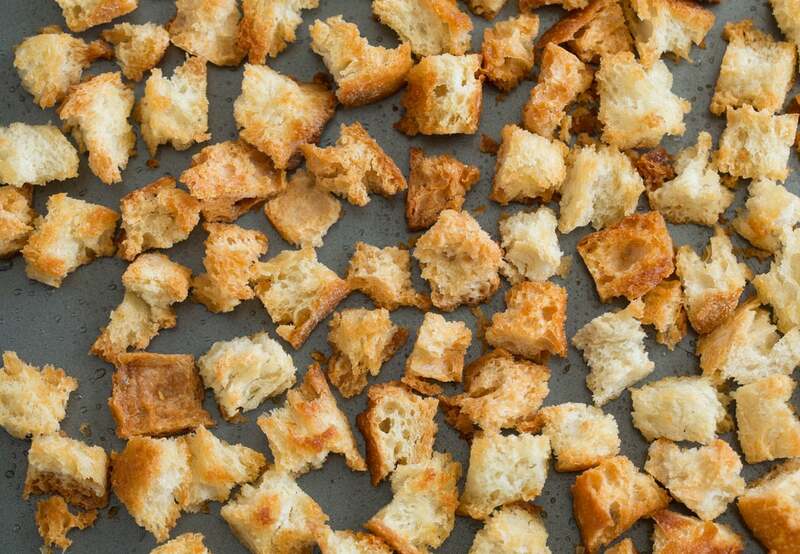 Day-old bread works best for the homemade croutons. Any bread will do, but I really like using a baguette, if possible. Use whole anchovies for the best flavor, not anchovy paste. Freshly grated Parmesan has a much better flavor than the powdered stuff in the shaker cans. 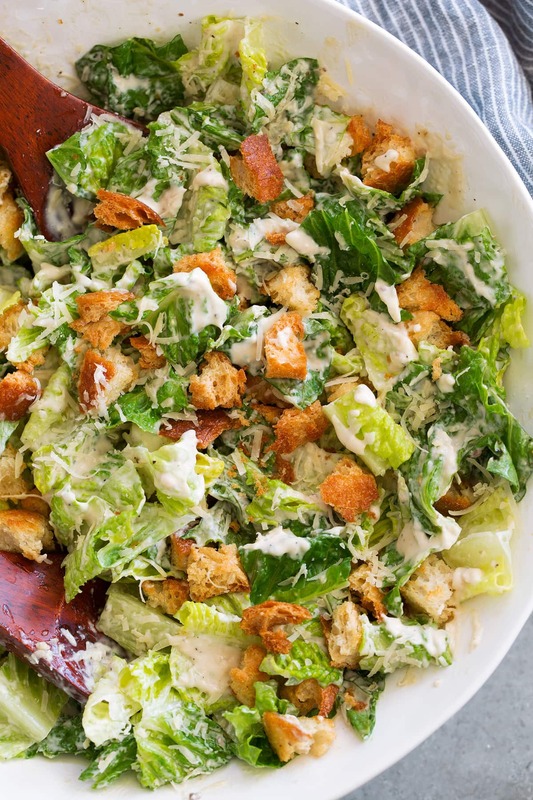 This is my favorite caesar salad! It's made with a rich and creamy homemade dressing and perfectly golden brown, crisp fresh croutons and lots of Parmesan. Don't shy away from the anchovies, they really pack flavor into this dressing and give it that classic caesar flare. 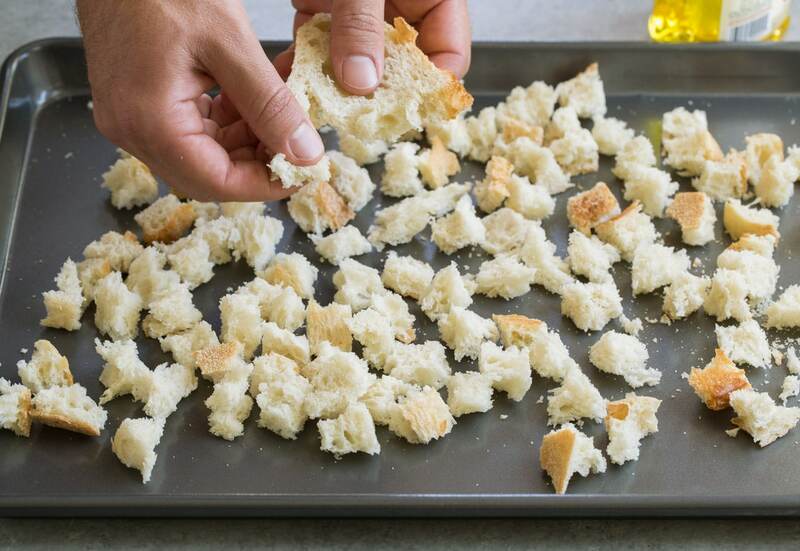 Preheat oven to 375 degrees F. Place bread pieces close together on a rimmed 18 by 13-inch then drizzle slowly and evenly with olive oil, then toss to coat. Spread bread across baking sheet. Bake in preheated oven until golden brown and crisp, tossing once halfway through, about 15 - 20 minutes total. 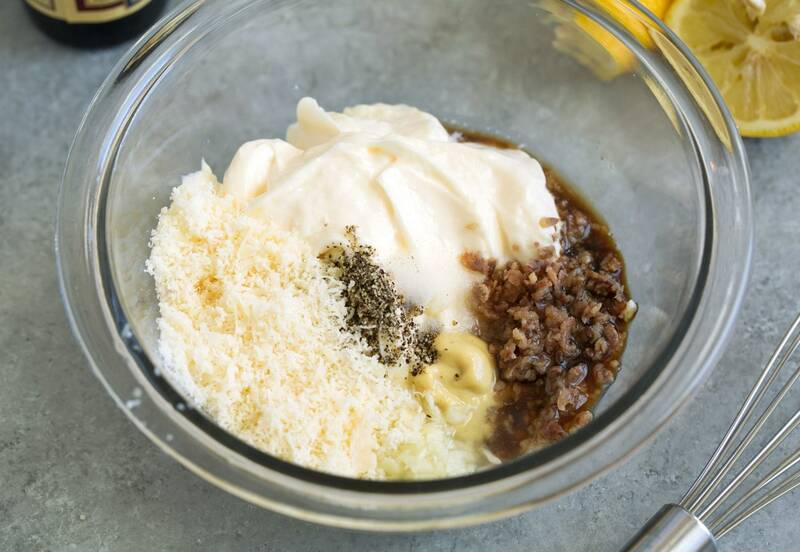 Meanwhile, in a mixing bowl whisk together mayonnaise, lemon juice, dijon mustard, Worcestershire, anchovies, garlic, 1/4 cup parmesan and season with salt and pepper to taste (you may only need a pinch of salt, then about scant 1/2 tsp pepper). 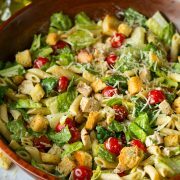 Place lettuce in a large bowl, pour in dressing then toss to evenly coat with dressing, then toss in croutons and remaining parmesan.